Retail companies all over the world are transforming their operations through merging digital and physical activities into a single experience. The current renaissance in retail is essentially driven by data and artificial intelligence (AI) solutions, which can help the employees get detailed insight into the desires and habits of the customers, and then offer today’s “digital customers” more personalized and relevant experiences. 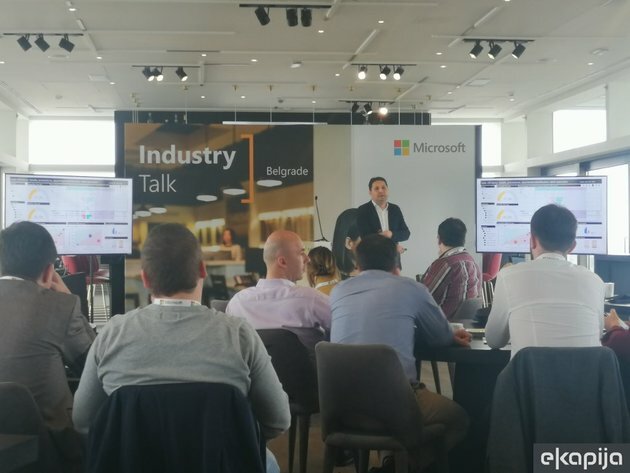 In order to present digital solutions and their possibilities in more detail, Microsoft organized the Microsoft Retail and FMCG Industry Talk, a gathering for users in the domain of retail and consumer goods, on March 20 in Belgrade. The event was attended by managers from the sectors of retail, production, organization, supply chain, marketing and other business processes, and the best practices and personal experiences were discussed by international experts of Microsoft and the regional partner companies – Kentico, Tools Group, Getron and Prefixbox. They showed how AI can help with supply stock management, supply chain planning and increase of the income by providing top user experience, using advanced online marketing technology. The increase of conversion rate with AI-based search was also discussed. – One of the presentations was called “The Future of Retail is Here” and, indeed, Serbia is not lagging behind other countries in this segment. Of course, countries in which the consumption is stronger use more advanced solutions to facilitate retail shopping for the end-users. On the other hand, retail and companies in the retail, CPG and FMCG industries are provided with tools which enable them to address some of their needs more easily – Miroslav Anicic, the sales manager for cloud solutions for corporate clients at Microsoft Serbia, said for eKapija. He pointed out that digital transformation in retail is reflected through 4 pillars – inclusion of clients in internal decision-making and various changes in approaching the market (engaging customers), optimization of operations through various IT tools, providing additional tools to employees in the retail industry (empowering employees) and the change of the product itself, that is, how to use tools to adapt the product to the demands of the market. – In Serbia, we are limited by the budgets used for digital solutions and we are trying to solve this in various ways. Through internal development, we can find an ad hoc solution for an ad hoc problem, or we can solve a concrete problem by using cheap solutions by local partners. However, there’s no thorough approach, in a holistic way, where a platform such as Microsoft’s can vertically integrate several operations in a single place. We upgrade a good base with additional solutions, therefore creating an all-encompassing solution for the entire organization – Anicic says. eKapija’s interviewee says that Microsoft has already considered which industries will be most influenced by the current changes – the existence of mobile devices, robotics and other modern solutions. – In this region, the focus will be on retail, production and financial services industry, but there are numerous solutions in other fields as well, such as energy. These are the fields that Microsoft can make the most impact on through its platforms, and the benefits are mostly related to the Azure platform, which offers Machine Learning, AI and IoT solutions. There’s also the possibility of having large amounts of data in a single place – Miroslav Anicic concludes.